Overweight Amir Khan stripped naked! 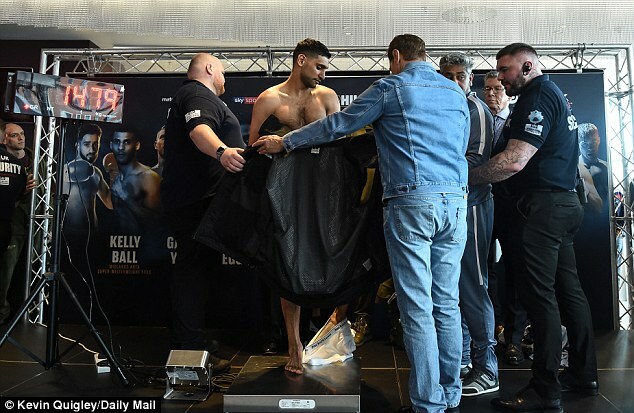 Amir Khan suffered a scare at the weigh-in as he was forced to strip naked to make the welterweight limit of 10st 7lbs ahead of this weekend’s fight with Samuel Vargas. The Bolton man failed to make the weight at the first attempt and had to remove his socks before being asked to strip naked, having been fractionally over the limit. It is the first time Khan has fought at welterweight since 2015, having beaten Phil Lo Greco at a catch-weight of 150lbs in his last fight. Khan has had five months to make the cut down to welterweight and appeared surprised after failing to weigh-in inside the limit at the first go. Removing his socks was not sufficient to make the 147lb limit, so a security guard’s jacket was needed to protect his modesty as he removed his briefs to hit the weight at the third attempt. His opponent Vargas had no trouble on the scales and comfortably weighed-in a pound lighter than the former lightweight champion on Friday afternoon. 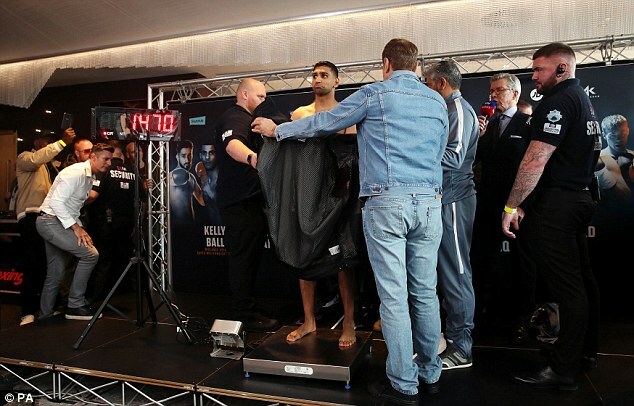 Khan was greeted with loud cheers by the fans in attendance as he entered the room to weigh-in ahead of Saturday’s non-title bout at Arena Birmingham. 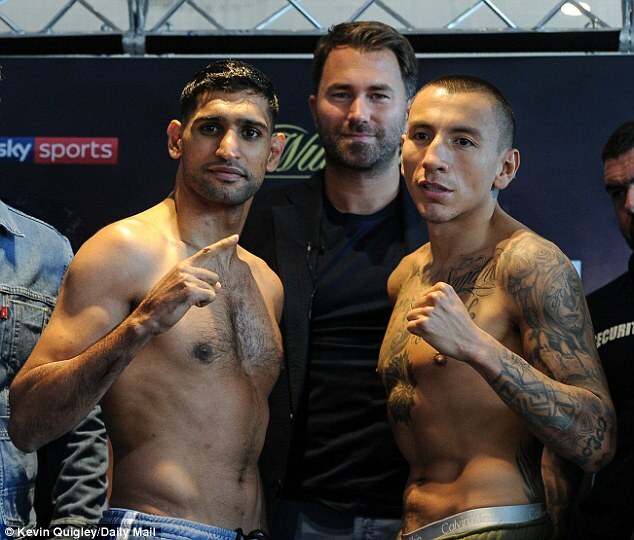 Despite having to remove his clothes, Khan looked to be in decent condition and has insisted this week that no stone has been left unturned in his preparations for Vargas, who he believes is a step up in class from his last opponent. The Canadian appeared confident on Friday as he has done throughout the build-up to this fight and engaged in a tense stare down with Khan as the pair locked eyes for the final time before meeting in the ring on Saturday. Vargas is banking on the premise of Khan’s glass jaw, but the Englishman has hit back and insisted he has only ever been hurt when he’s gone up in weight and that the welterweight division is where he operates best. Victory on Saturday would see Khan take a huge leap towards securing a world title fight against Manny Pacquiao or domestic rival Kell Brook.